UNIVERSITY PARK — It was a story that needed more than a year to start unfolding, but when it did, Penn State wide receiver K.J. Hamler made every bit of it count in just the first chapter. 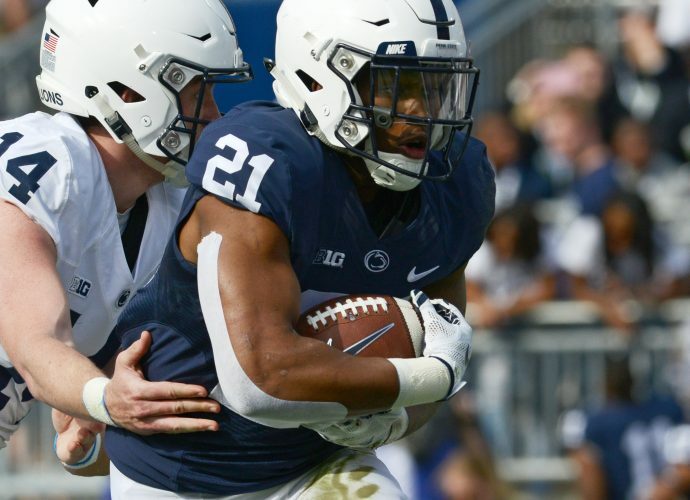 After redshirting his freshman year to heal from a leg injury he suffered in high school, Hamler broke onto the scene in a rather explosive style in Penn State’s thrilling opening-week win. The wide receiver accounted for three of the biggest — if not the biggest — plays of the day for the Nittany Lions. The first came in the third quarter when he reeled in a 46-yard catch — the longest play of the day for Penn State — to set up a Miles Sanders’ touchdown. He was then the beginning and end of the game-tying drive to force overtime. He first hesitantly brought the kickoff out of his own end zone for 52 yards to set up Penn State rather nicely in Appalachian State territory. He capped that same drive off with a 15-yard touchdown reception. His success on the field has received a lot of praise off of it but he credits much of it to his teammates. Hamler brings an aggressive style of play to the Nittany Lions. With Appalachian State kicker Michael Rubino placing the ball deep in the end zone on many of his kickoffs, teammates often told Hamler to go down to a knee so the offense can start at their own 25-yard line and not have to make up for any lost ground. He had an itch throughout the game to bring the ball out and see what he can do on kickoffs. It paid off with him doing so with just over a minute left and the Lions looking to avoid the upset. It’s something he’s now gone back to see what improvements he can make in case Penn State is again in a tight situation late. “I’ve probably watched that 1,000 times to be honest with you, just to see why I made the decision I made, what I could’ve done better,” he said. The decision to bring it out didn’t get him in as much trouble with coach James Franklin as Hamler imagined it would. The doubts he had with bringing the ball out of the end zone on kickoffs were nothing like the ones he had when recovering from a torn ACL. “I had a lot of doubt going through my mind. I used to sit in my room and cry all the time,” he said after Saturday’s game. He brings a certain energy to a team that needed it Saturday and will certainly need it again as the season progresses. Franklin said after the game he wanted Hamler to play like he practices and give him more chances to change the outcome of a game.